The Mississippi Mills Active Transportation Advisory Committee (ATAC) is working on an “active transportation for students” initiative: bike lanes to the high school on Martin St. North, as well as bike lanes on Sadler Dr. to provide students access to the elementary schools. ATAC recognizes that Paterson St. is not wide enough to create dedicated bike lanes, and is exploring other options that will connect from the current and planned cycling lanes to the schools on Paterson St.
A Public Information Centre (PIC) for the Martin Street North and Sadler Drive bicycle lanes has been scheduled for May 30 at 6:00 pm in the auditorium at the Old Town Hall. If you would like to support the development of safe and active transportation routes in your community please attend the Public Information Centre and/or send your comments to Guy Bourgon. 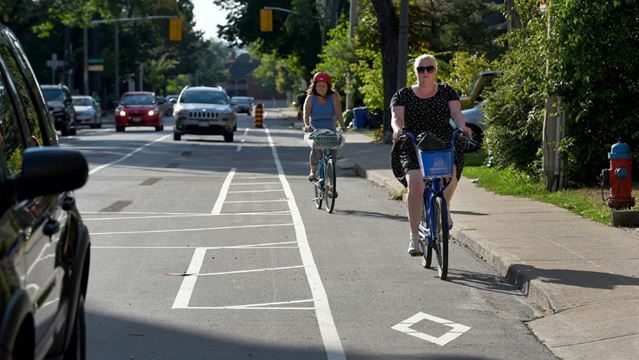 Well done Almonte, you folks continue to out-shine your urban brothers & sisters in supporting safe cycling. Keep it up. Now if you can just get those ATVs out of town!